To raise the headrest, simply pull it up to the desired position. To lower the headrest, press the release lever on the left side grommet, while pushing the headrest down to the desired position. 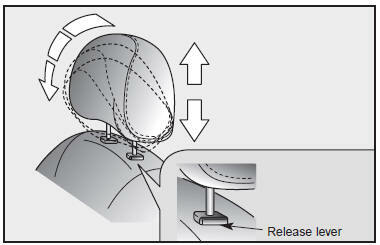 To remove the headrest, raise it as far as it can go then press the release lever while pulling upward. The headrest may be adjusted forward to three positions by pulling if forward. To adjust the headrest backwards, pull it forward and release it. To reduce the risk of head and neck injuries, don’t operate the vehicle with the headrest removed or improperly positioned. For best protection, adjust the headrest so its center is as high as your ears. Do not adjust the driver’s headrest while driving.